Call our office directly for a Free Estimate: 904-379-5843No matter where you live across the Jacksonville, FL area, the professionals at Show Me Tree Service will happily help you keep your trees healthy and your yards beautiful. Our tree services include tree removal and trimming, as well as stump grinding. We have the experience and the skill to make your yard look lush and pristine. Trees occupy a large portion of the landscape’s visual space, so when they look vibrant, the rest of the property does too. When you trim your trees yourself, you risk damaging the trees with a stray cut or injuring yourself with tools you don’t know how to use. Let a professional take care of this task for you. 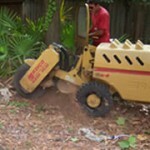 We have helped Jacksonville, FL residents with their trees for over 15 years. We also use the industry’s most advanced techniques, so your trees will be healthier and more attractive thanks to our tree services. Tree Removal of just one tree or many, we handle it all. Residential or commercial, call us and we’ll prepare a free estimate. Top-off tree trimming, no limits. We’ve been performing Tree Trimming services in Jacksonville, FL for many years. We can provide any tree trimming service you may need. All or part-tree trimming service. Large Oaks to Small Pine trimming. Home tree trimming service, makes your home beautiful. A job that serves a functional purpose. Our stump grinding service can finish the job which helps to avoid damage to your lawn care tools and adds an extra sense of convenience to your property. Totally cleared after tree removal to protect your property. We can finish the job when all trees are gone. 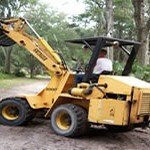 In addition to our tree services, we also offer landscaping assistance. We know how to accent the nonliving materials on your property with particular plants. We also try to use native plants where possible to minimize your property’s environmental impact. As a result, you’ll have a gorgeous, low-maintenance yard. Simply tell us your design goals, and we’ll get to work. 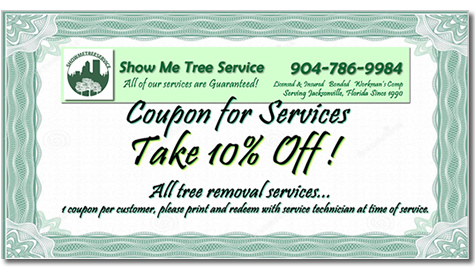 If you need tree trimming or landscaping services in the Jacksonville, FL area, give Show Me Tree Service a call at (904) 379-5843. Once you’ve hired us, we won’t rest until you have a yard you can feel proud of. If you’d like a free estimate, or if you have any questions or concerns, don’t hesitate to get in touch with us.